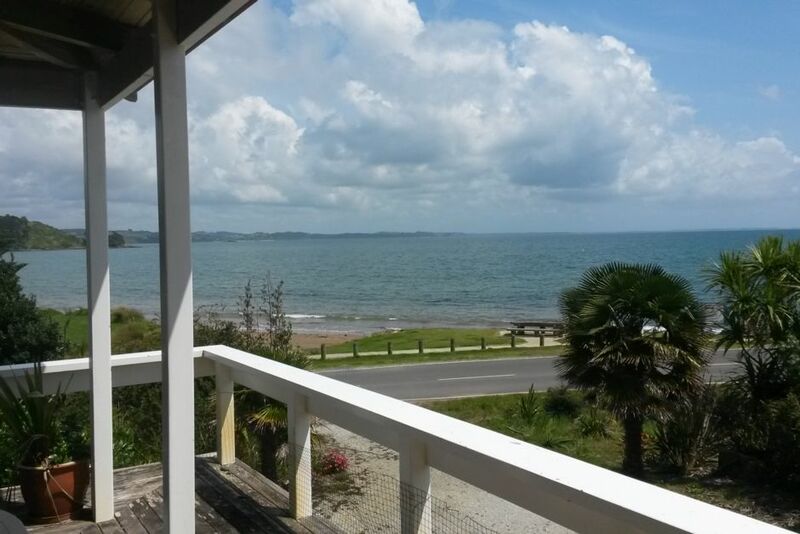 Prime HIHI beach waterfront site providing uninterrupted views and access to the magnificent Doubtless Bay. Watch your friends and family swim, boat and enjoy the safe beach from the deck, kitchen, lounge, dining and master bedrooms. Double storey, pine sarked 'lodge' interior. Fully equipped with basic furnishings, linen and full compliment of household utensils. Spacious flat lawn, plentiful on-site parking, outdoor stainless steel fish filleting station and cabinet fish smoker for your daily catch!. Only 10 minutes drive from Mangonui takeaways, restaurants, bars, service station, groceries and other shops and services. Please contact us for negotiable low season discount and conditions. Pricing for advanced booking may vary to those listed. Availability subject to change without notice. High season tariff applies to EASTER weekend. A totally amazing location for a traditional kiwi holiday! Plenty of room for our group of nine, a great deck with superb view and a nice quiet beach which is perfect for young children. We were even visited by three Orca Whales on the day we arrived. Cooking was a little bit tricky as two of the elements didn’t seem to be working at full heat and the BBQ is probably getting a bit tired. Great responses from our host and information provided before our arrival. We are reroofing thr bach next month and making a few changes including a new cook top! It’s all about the location! Beautifully located home with fabulous views even from the master bedroom. There is the lovely beach across the road, Mangonui itself or as we did, opportunities for day trips to Kerikeri, 90 mile beach and Cape Reinga. The house itself has been well lived in and shared so probably due some maintenance, but this more an observation rather than an issue. The house offers everything you need for a longer stay including the use of a washing machine (and even an indoor line). Also, there is the added convenience of linen being provided! Owner is very friendly and great to communicate with. Thank you for everything! Perfect for a small group, everything we needed was there for us to relax and enjoy. Thank you very much for such a lovely place.